I’ve been a remote or semi-remote worker for a long time now. Which has a boatload of pros (flexibility) as well as cons (distance from “the watercooler”). Over time, I’ve tried lots of things to help forge a stronger connection among my distributed or semi-distributed teams. As you would expect, it’s always a lot harder in the semi-distributed context, where some people are face to face and some people aren’t. In those cases, it’s always hard to get the f2f people to adopt technology for casual chatting. My new favorite tool for this is Sqwiggle. 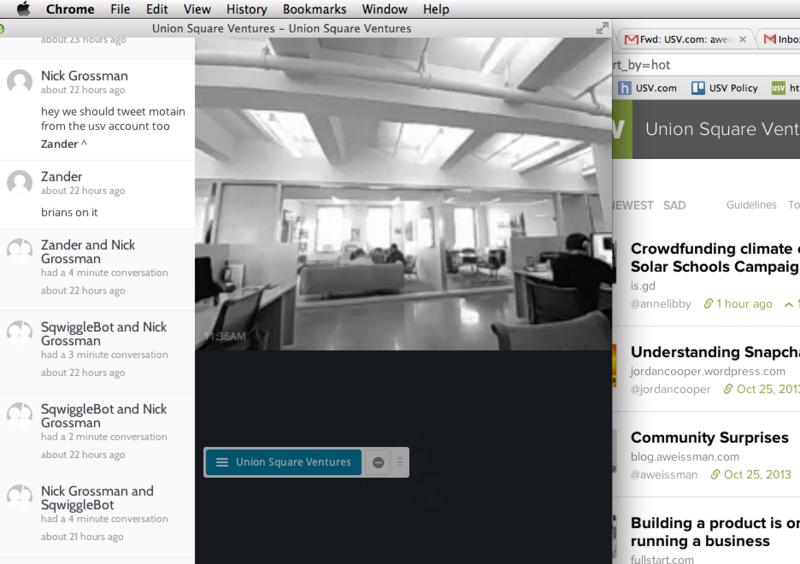 Sqwiggle is a chat / video service for distributed teams. My favorite feature is that, rather than seeing each person in always-on real-time video, you see black & white snapshots in 10-second intervals. This removes a lot of awkwardness. My second favorite feature is the ability to initiate a video conversation unilaterally — in other words, if I want to video with Zander, I just click on his face and start talking. No need for “ring him”. The folks at Sqwiggle like to note that this results in much more frequent, but a lot shorter, conversations (like what you get when you’re in an office together). You can see Zander on the right, and Fred’s and Albert’s offices in the background. So, that’s been great, and we’re using it more and more. The thing that is more vexing is actually a much simpler problem: Group chat. Back when I was at OpenPlans, we were heavy IRC users. The whole team (folks spread across multiple cities, but concentrated in NYC) was always in the #openplans IRC channel, and it was the social hub of the office. And not just for remote folks — when it was time for lunch, people would ping the IRC channel. There was tons of chatting back and forth, via IRC, among people sitting next to each other. It was, and is, great. 1) regular chat is unobtrusive. Meaning, you can be in a room, but not get a notification of every single message. 2) username notifications. when someone wants to get your attention, they just mention your handle, and your client bounces a notification to get your attention. 1 and 2 together mean that you can stay logged in to the channel all day long, not be overwhelmed by it, but still be directly reachable when people want to get your attention. 3) it’s hackable. Since it’s an open system, you can write all kinds of hacks. Our SVN repo was tied into IRC, so every time someone committed code, it posted to the channel. We had a bot that would reply to certain kinds of questions with silly answers. You can build whatever kinds of things on it you want. In sum, it was (and is) a fantastic tool for staying connected with a large group. 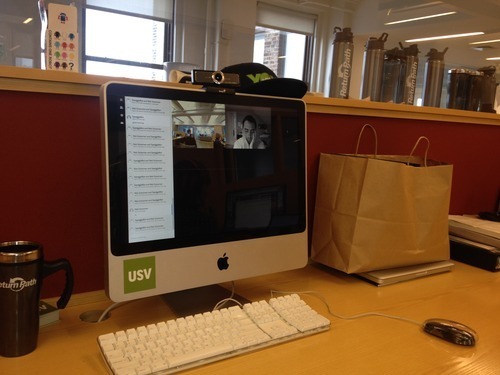 If you were to add in persistent history and video-chat, you’d have the perfect tool. it’s worth noting that you can do similar things with other tools. Campfire, by 37signals, does a lot of this. So does Skype. Those are good tools, but what I’ve been looking for recently, but haven’t been able to find, is a way to get a similar experience out of Google Hangouts. The reason being that the entire USV team is in Gmail all day long, and does a fair amount of one-to-one chatting in gChat (now Hangouts). So, rather than doing the (likely impossible) work of getting everyone to use a new tool, I really really want a way to accomplish this in Hangouts, which we all already use. So, I’ve been trying to figure this out. And it’s been frustrating. If there is a solution out there, I’m dying to know it.